The biggest problem with the film is its premise – it isn’t original. 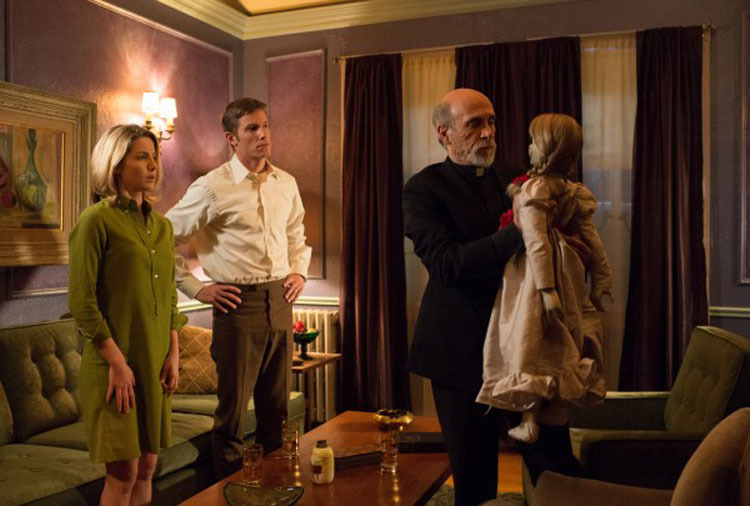 It’s not the first time the concept of a haunted doll was introduced. Take the clown dolls of “Poltergeist” (1982), Chucky of “Child’s Play” (1988), or Dolly of “Dolly Dearest” (1991), for example. Interestingly enough, before taking on “Annabelle”, director James Wan brought the ventriloquist doll Billy to life in his film “Dead Silence” (2007). It’s almost as if he is recycling old ideas. Admittedly, it’s not all about originality. It’s about presentation. Disappointingly, the film follows a formulaic and clichéd approach. Much of the film follows a day-night cycle in which “scary stuff” typically occurs at night. Inanimate objects begin to move – rocking chairs rock, sewing machines turn on, dolls change position, etc. Eventually, a supernatural specialist – Father Perez (Tony Amendola) – is sought after for assistance. Another problem with the film is how calm Mia appears after witnessing terrorizing, supernatural forces. I can’t help but think a natural response would be to suffer post-traumatic stress disorder – because how do you just recollect yourself after being knocked over by an invisible force, witnessing the ghost of a little girl running through your home, and escaping the clutches of a possessed doll who is keen on dragging your soul to Hell? However, I will give credit where credit is due. Although it reminds me of the demon in “Insidious” (2010) – another film directed by Wang (recycled ideas, cough-cough) – the black demon possessing Annabelle is absolutely terrifying. By far, the scariest sequence was when Wan (purposefully, I’ll assume) manipulated lighting to his benefit. SPOILER ALERT. In a transition from one cut scene to another, the lights were cut off so abruptly, my eyes needed to focus. For a moment, I sat in silence with the darkness, struggling to make out what was on the screen. Suddenly, it was clear that villainously staring into the camera eye – at me – was the black demon, crouched in the shadows of a staircase. The audience was shocked. A woman somewhere in the front row flailed her arms out and shrieked, “Oh God, no!” I really wish the entire movie played with this type of effect to evoke fear. Unfortunately, this is not the case. Again, “Annabelle” does execute certain elements of horror very well. Overall, however, it’s an excruciatingly slow-paced movie. This is a problem. Horror is meant to enthrall and evoke anxiety throughout. If there are breaks between horrors, the viewer has time to recollect, thus negating the whole point of the genre. Unless you’re truly frightened by staring at dolls in rocking chairs, I do not recommend this film.